This page will guide you to fix low disk space on system partition when Windows Server reports the low disk space warning message. Have you gotten low disk space alert message on system partition in Windows Server? You can use professional partition software to resize hard disk when running into low disk space problem. IM-Magic Partition Resizer Server allows you to resize system partition on all Windows Servers without having any influence on the operating system or the performance of your computer. This partition software has the ability to extend partition, shrink partition and move partition without deleting or moving any data on the disk. You can follow the steps below to perform partition resizing when system partition is running out of disk space on any Windows Server. You need to move the unallocated space close to the system partition. Then, you can right click the system partition and choose "Resize/Move" option. Move the arrows to extend the system partition and then click "Apply" button. "Today when I started my PC, system reported an alert message on C drive (system partition). It said C drive is running on low disk space and I need to delete some old files to free up disk space. After turning on the computer, I went to the system partition and checked its Properties. I found that there is only about 1GB free space on this partition, but the problem is that I have never stored any data to this partition. I cannot delete any data from system partition because I am afraid that it will cause system crash. Can anybody tell me if there is any way to fix the low disk space problem on system partition without deleting or moving any data? By the way, my PC runs Windows Server 2008 operating system." "Windows 2003 is running out of disk space on C drive. 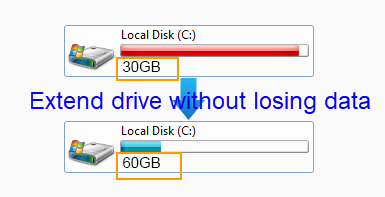 Can you tell me how to extend the partition without affecting the performance of computer or reinstalling system? Recently, my PC is running more and more slowly. I am not sure if it is caused by low disk space problem." System partition is an important part on a computer, so you should deal with this problem seriously when you receive low disk space warning message. Usually, when a system partition is running out of disk space, system will ask you to delete some old files to free up disk space. When the free space on system partition is less and less, it may cause system crash or other kinds of problem on your PC. In order to avoid such kind of problem, you can fix the low disk space problem on system partition by using partition software. With the partition software, you are able to move free space from another partition on the same hard disk so that you do not need to delete or move any file from the system partition. Simply say, the partition software enables you to increase the size of system partition by moving free space from another partition. As professional partition software, IM-Magic Partition Resizer Server can be compatible with all Windows Servers including Windows Server 2003, 2008, 2012, Windows SBS 2003, 2008, Windows Server 2003 R2, Windows Server 2008 R2 and Windows Server 2012 R2, etc. Therefore, you can use this partition software to expand system partition on Windows Server without any limitation. This partition software provides easy and secure method to resize hard disk. It works on all brands of hard disks when you run into low disk space problem. 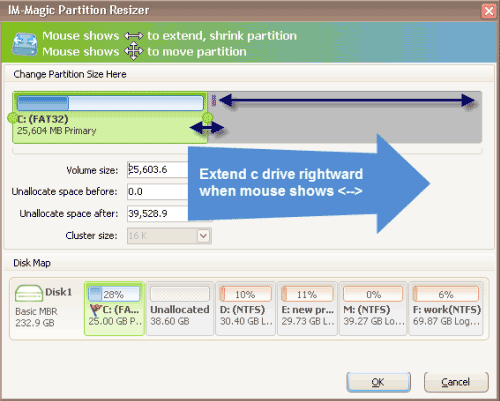 It is safe to use IM-Magic Partition Resizer Server to resize hard disk. This partition software can reallocate disk space without touching even a single file on its location. In addition, you have no need to format the disk by using this partition software. IM-Magic Partition Resizer Server works with FAT32 and NTFS partition. You even have no need to reboot your PC by using this partition software to perform partition resizing, so it is time-saving.